Taking Barack O’Llama for a walk with ShangriLlama at Bob Woodruff Park, Plano. Are you looking for a new adventure? 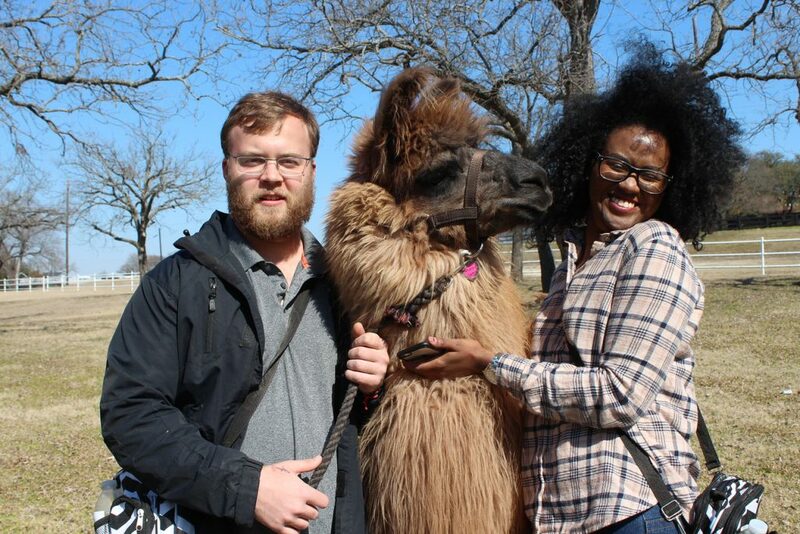 No prob-llama, I’ve got the perfect idea: a llama walk through Plano. 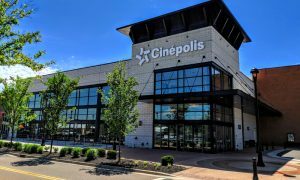 An adventure that will hands down be the most unique and active learning experience you’ll ever have in the Collin County area! I speak from experience. The sky was bright and cloud-free, crisp air with a perfect breeze on a Saturday. I headed out to the “country” in Parker, Texas, three miles from Southfork Ranch. As I pulled up to the adorable ranch-style home of ShangriLlama, I thought to myself, what am I getting into? Sure, I signed up for the experience but I didn’t really know what the day would entail. 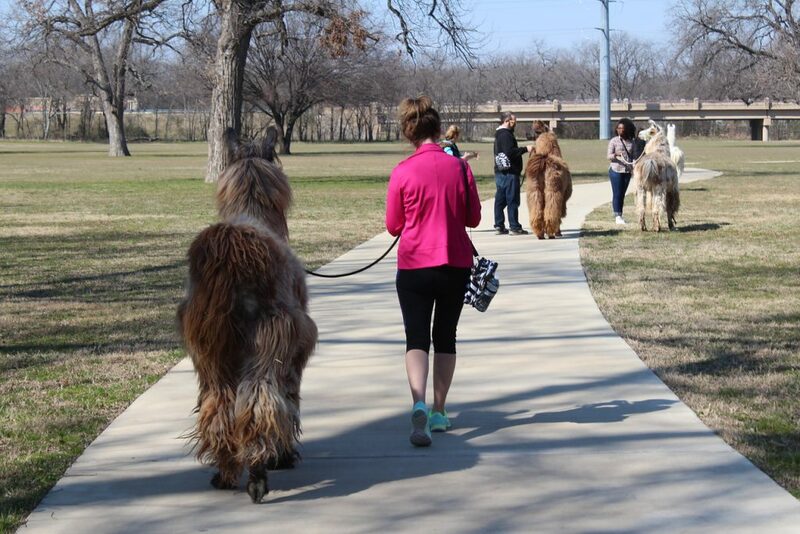 The only thing I knew for sure is that I would be going on a llama walk. It sounded strange to me, too. 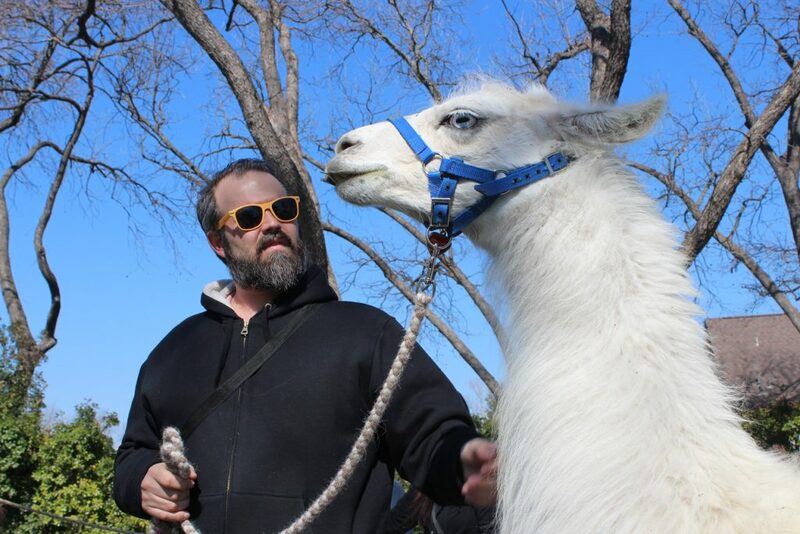 I imagined I would walk a llama on a leash just the same as I walk my dog. But it was so much more than that. My friend Kendra Golden and I were greeted by a smiling face and sweet voice; Sharon Brucato, aka “Mama Llama.” She took us around back to the large, high-fenced yard where we met the whole pack—Dalai Llama, Como T. Llama, Bahama Llama, Drama Llama and Barack O’Llama. Hilarious! Their names are completely fitting of their diverse personalities and looks. “Llamas have a strange way of getting to know someone. They like for you to blow in their nose,” said Mama Llama. 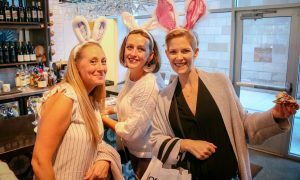 Giggles and huge grins quickly became the apparent accessories of the day, first made visible by everyone’s reaction to Mama’s comment. 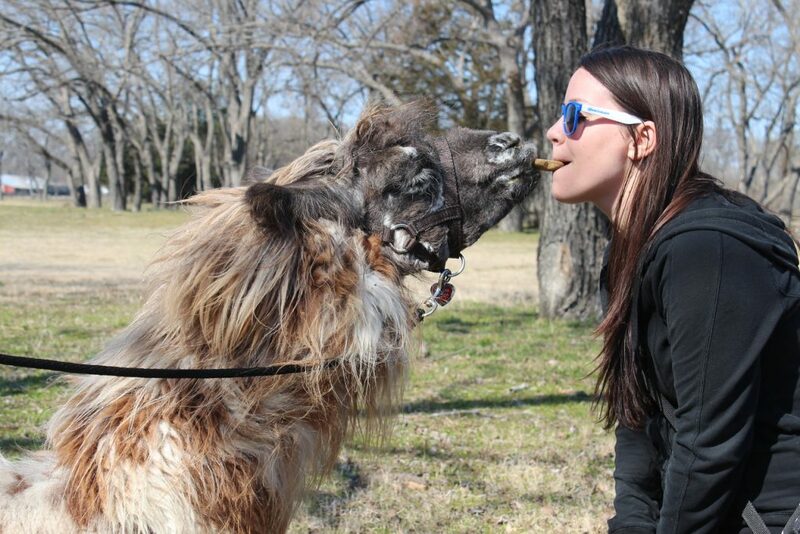 We mingled for about an hour with the llamas and the other four guests, two of which were on a Valentine’s Day date. 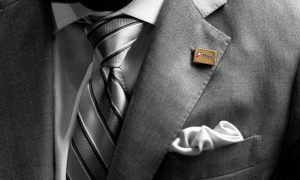 Then, it was time to start rounding up the pack, which was a show in itself. The llamas seemed to play games, but as soon as they were strapped into their gear, they meant business. Mama Llama and her husband, Paul Brucato, provided each of us with our own bag equipped with llama treats and food, a question card, and a human treat and bottle of water. Less than a two-mile ride in the car and we arrived at the park. We were promptly handed a llama walker card, which listed the llamas’ names in a specific order. “Without it, you would forget which llama you were to walk next to. Trust me. 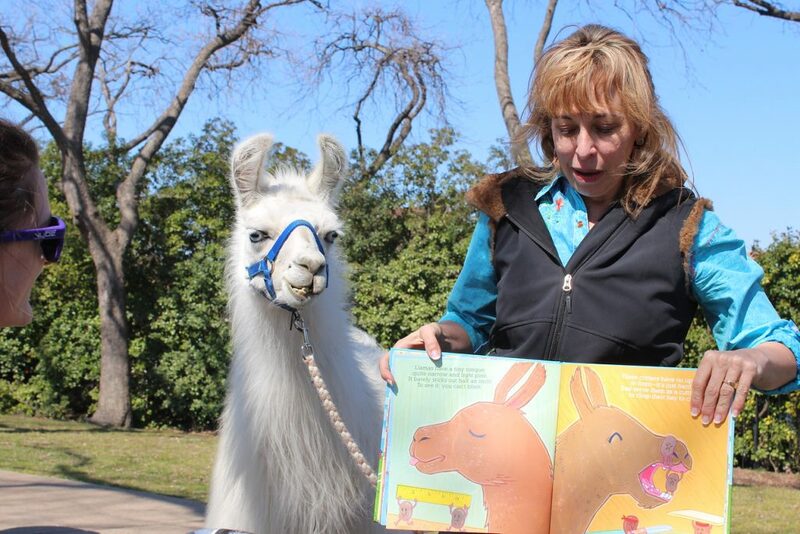 And I want you all to have the opportunity to walk every llama,” said Mama Llama. I thought, there are only five llamas it cannot be too hard. First up for me was Drama Llama, the tiniest of the bunch since he’s a quarter alpaca. Throughout our walk, runners, bikers, other walkers and their dogs passed, and as they did, their necks often craned back around to take a second look. Why wouldn’t they? 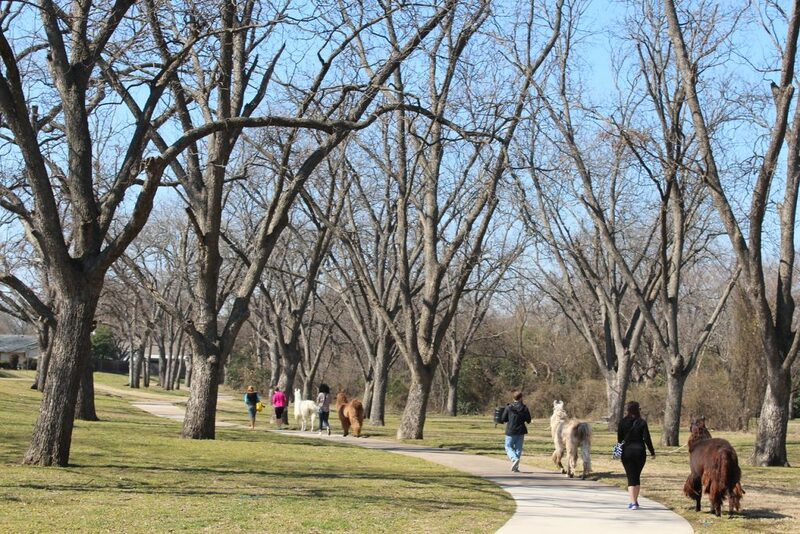 It’s a group of people walking a pack of some type of foreign animals through a public park! It was time to make the llama swap, and crazy enough, I couldn’t remember who was next. 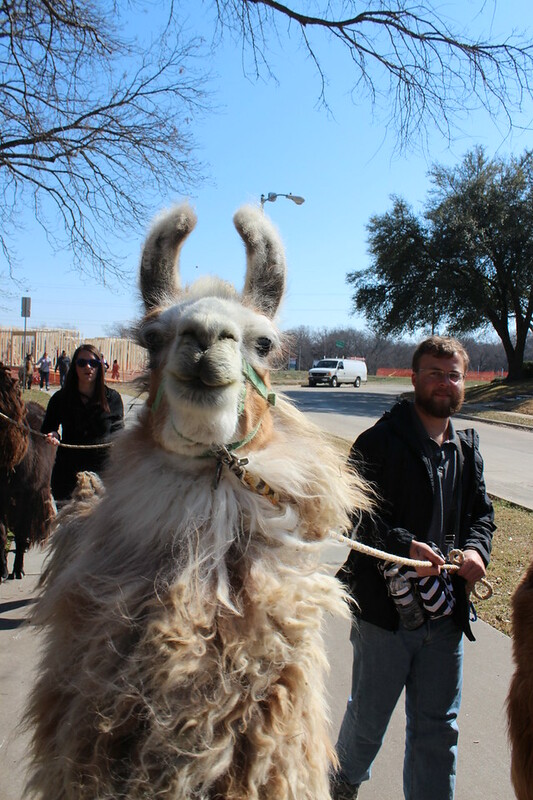 I had so much fun with the llamas and everyone in the first-quarter mile or so, the name of llama #2 had already slipped my mind! 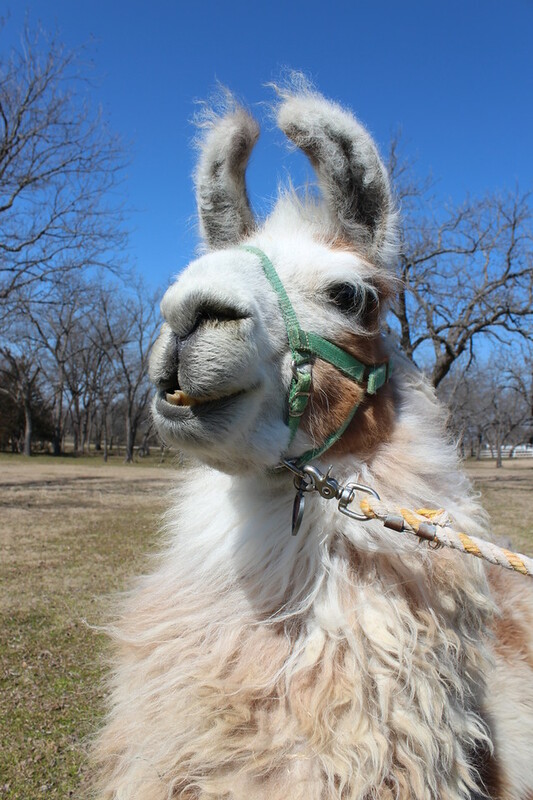 My llama #2 was Dalai Llama, the leader and most rare-looking of the pack with white wool and two ice blue eyes. I led the group—or, if I’m honest, Dalai did—with Dalai by my side until we reached our pit stop. Sharon Brucato aka Mama Llama accompanied by Dalai Llama teaching us all about llamas. The llamas occasionally wrestle and the one who wins the most matches is deemed the leader. 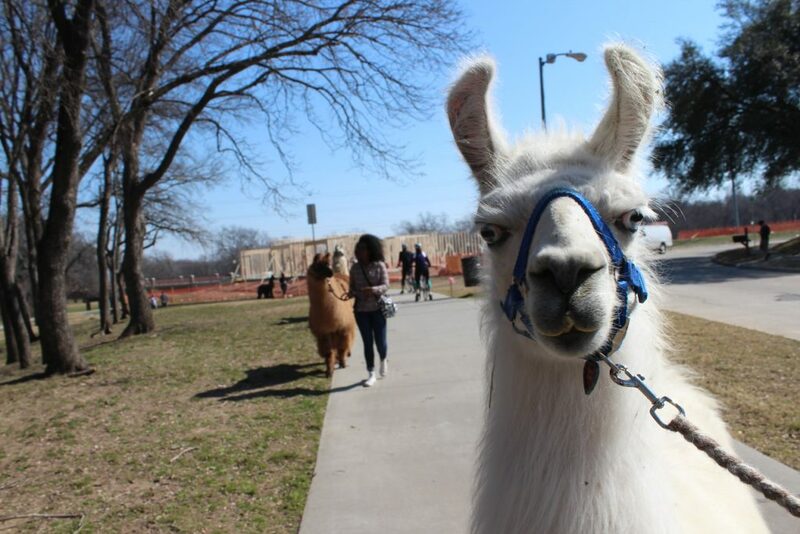 (Dalai Llama, again, is the leader of ShangriLlama’s pack, but Bahama Llama will probably soon remove Dalai from the ranks. Even though Bahama is the youngest in the group, at 2 years, he shows great leadership skills and has a take charge attitude.) Llamas live an average of 15–18 years, and with Dalai being the oldest at 6 years, the Brucato’s llamas will fight over the top position for years to come. Also, Como T. Llama from ShangriLlama is the most famous llama in the world and gained his fame on an online comedy called “Llama Cop.” Como can also be spotted on an episode of TMZ, the celebrity gossip news channel. They are group poopers, meaning they all poop in the same area and often go to the bathroom at the same time. Lamas don’t spit (at humans); that’s their cousin, the alpaca, One of 30 domesticated animals in the world, They can run 35 miles per hour—about as fast as their main predator, the coyote. They have no top teeth, Lamas drop odorless poop, They are hypoallergenic, Lamas can conceive at any time—they’re induced ovulators.“Kush” is the term used in place of “sit”and lastly, Llama medicine is not available, so they use small doses of horse meds. My personal suggestion: When you go to ShangriLlama, ask Mama Llama why all of the llamas are boys. Barack O’Llama, then Como T. Llama, walked beside me next. Similar to the others, they were compliant and sweet-natured overall, and liked me even more once I fed them treats. Llama #5, my last and favorite llama, was Bahama Llama, a great companion to end our 2–3 mile walk. The group gathered around for final farewells, and a few of us took Mama Llama and Paul’s suggestion of placing a treat in our mouths and feeding it to a llama, Lady-and-the-Tramp style. Already in a carefree mood from the relaxing and fun-filled day, I jumped at the chance and experienced an accidental smooch from a llama. Three hours, and about three miles later, and no one in the group even noticed the time or how far we walked—it was that great of a time! 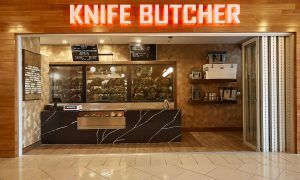 This unique and active learning experience is a bucket list item I never knew I wanted, but is now checked off. Thank you, ShangriLlama, for giving my typical Saturday a run for its money. 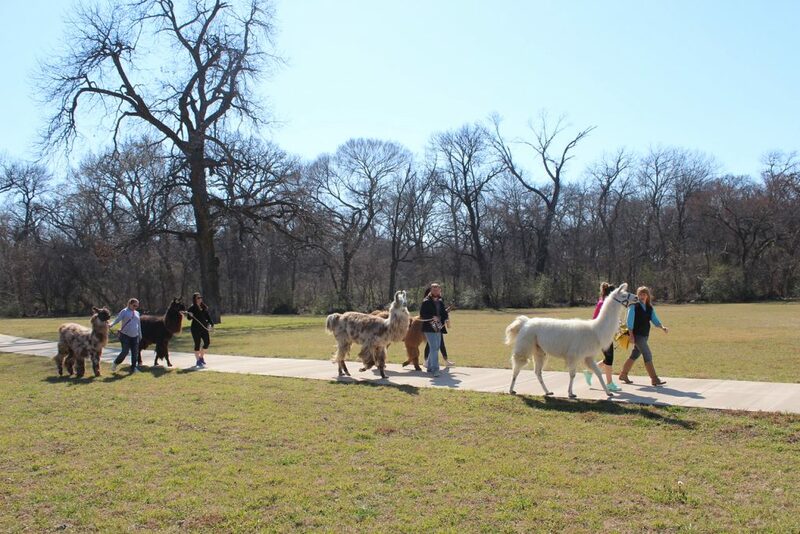 Interested in a llama walk? 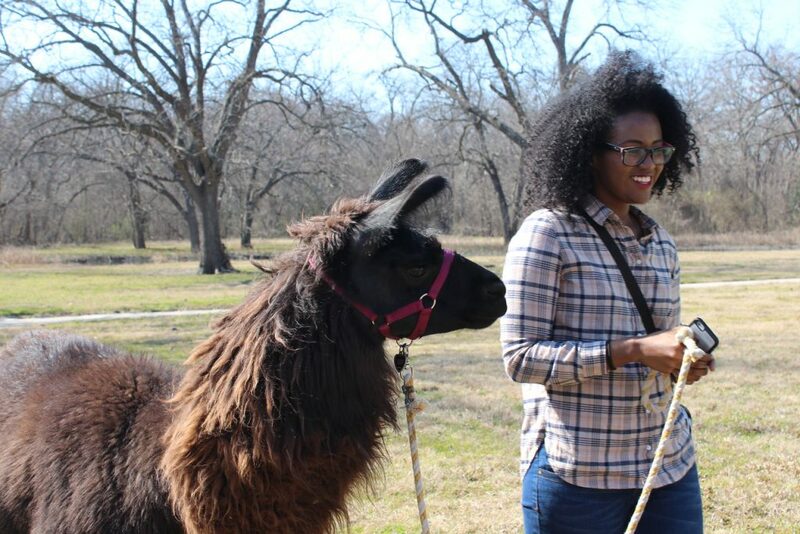 ShangrilLlama offers llama walks from 8–10 a.m. on Saturdays and from 2–4 p.m. on Sundays every spring, winter and fall. Summer heat changes the schedule, but Saturday walks are still available, if the temperature remains below 90 degrees. 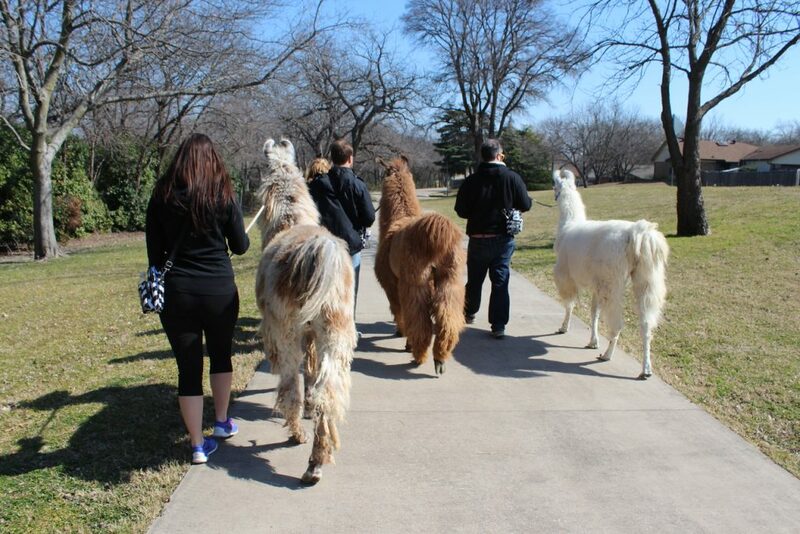 Llama walks are $50 per person, however, check Groupon for a discounted price. 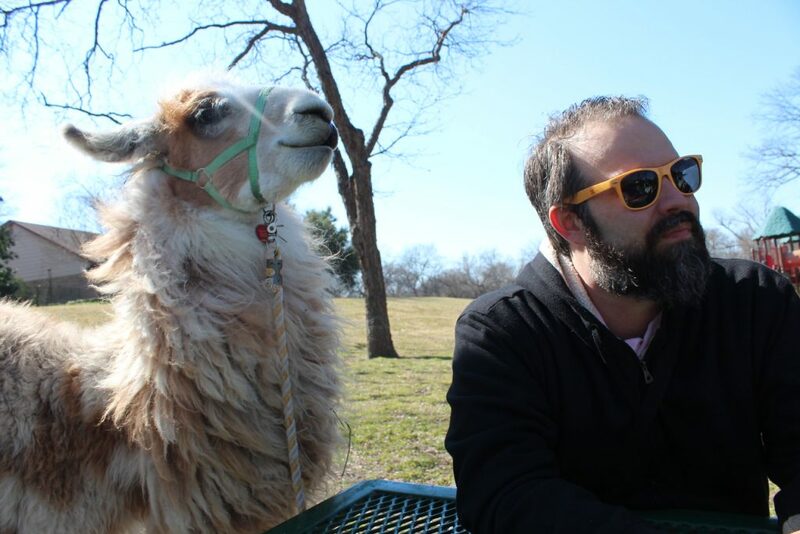 The Brucato’s originally purchased a llama as a pet for their son. 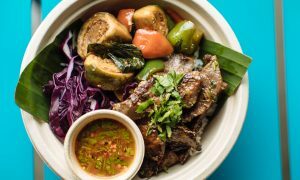 After researching them and purchasing a few more, they started their llama business in 2008 in Yorba Linda, California. They knew ShangriLlama would be a hit here, too, and opened ShangriLlama soon after their move to Texas a couple of years ago. Peek-a-boo! Strolling with Dalai Llama. With Shangrillama at Bob Woodruff Park, Plano.